Apple finally unveiled OS X 10.10 Yosemite earlier on this week at its Worldwide Developers Conference keynote speech, and although we knew the UI would be overhauled in-keeping with the look of iOS 7, it was nice to check out the upcoming software in all of its glory. If you’re on a Mac, there’s a good chance you’ve already grabbed the Developer Preview for a first-hand look at what’s new, but if you’re on Windows, things are a great deal trickier. 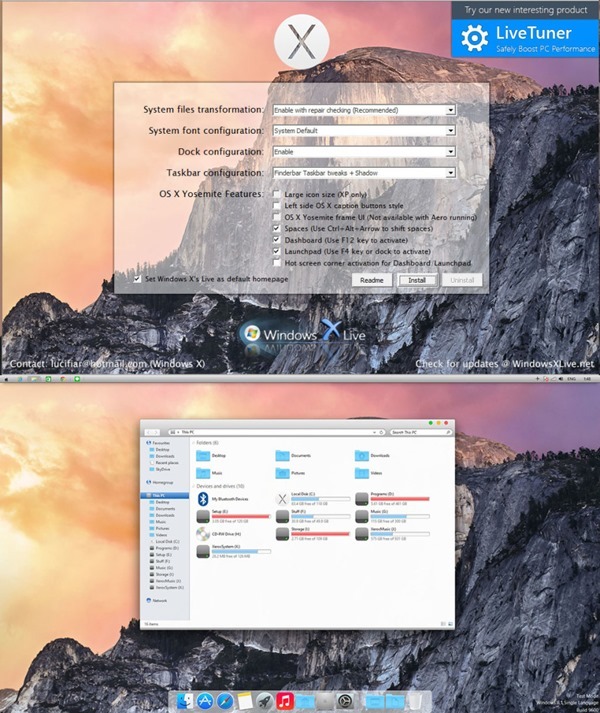 There are numerous ways to install OS X on a PC, of course, but if you’re merely a fan of the aesthetics, then you might want to check the just-released OS X 10.10 Yosemite Transformation Pack for Windows 7/8.x. If you’ve ever used a transformation pack in the past, you’ll be more than familiar with the procedure, but for the uninitiated, perhaps a little background information information is in order. 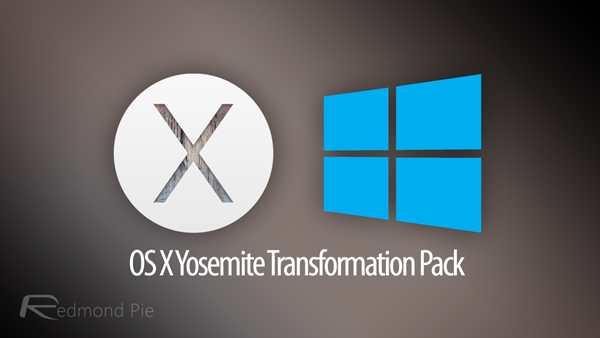 The transformation pack will not transform your Windows PC into an OS X-incarnate, but rather, skin your operating system to give the appearance that you’re running on that all-new Mac software. Thus, all of the features and settings will remain very much Windows, but it will, for the most part, look like you’re running on OS X 10.10 Yosemite. 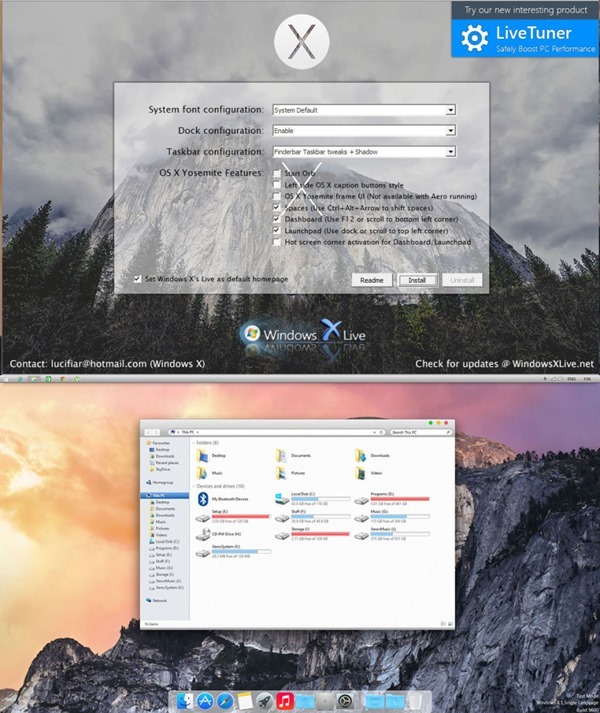 Given how the visual alterations account for the majority of Yosemite’s new features, you’ll certainly want to check out this Transformation Pack if you’re a fan of dressing Windows up like Mac, and even though it’s not quite a perfect replica, it’s close enough. Inside the pack, you get the UI elements, wallpapers, stock images, and the developer has also made it a lot easier for Windows users to install. Typically, wannabe themers would need to install utilities like UXStyle Core and UX Theme Patcher, but given that the Transformation Pack will automatically tweak system files to facilitate the installation of the theme, there’s a lot less messing around involved this time around. Before you install, it’s always worth backing up your important files just in case, and although nothing is likely to go wrong, it’s better to take the precaution. Download the Transformation Pack and UX pack via the links provided, and be sure to leave your comments via the usual channels.